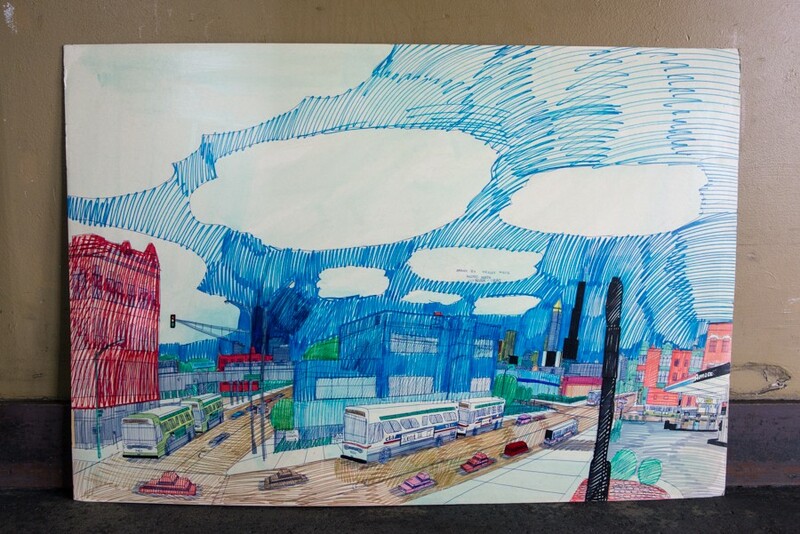 Quenchers owner Earle Johnson unearths his collection of Wesley Willis drawings. Last month word got out that Quenchers Saloon, a beer-lover's pub that straddles the border of Logan Square and Bucktown, was up for sale. Owner Earle Johnson, 75, put the building on the market in November, but word didn't spread widely till after he placed a big sign above the door. 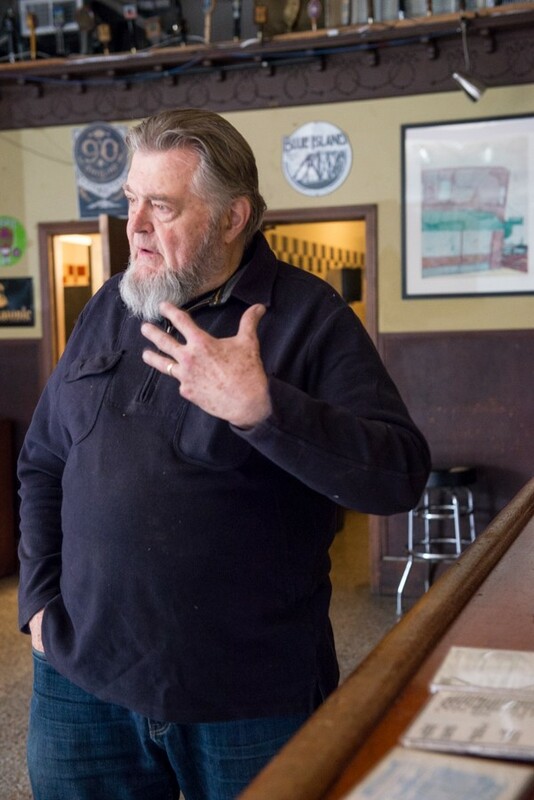 Johnson has owned the place for nearly four decades, and as he recently told Tribune reporter Josh Noel, he doesn't have the energy to run a bar anymore. Given the rapid gentrification of Logan Square, neighbors quickly expressed concerns online about the future of Quenchers. Johnson's current asking price is $1.65 million, and many folks are worried that an opportunistic developer will come up with the money before anyone with their heart set on keeping the character of the place intact. But Johnson says he wants to sell Quenchers to someone who understands its role in the community. "We've got a number of people that would want to keep it very close to what it is, as far as what's here," he says. 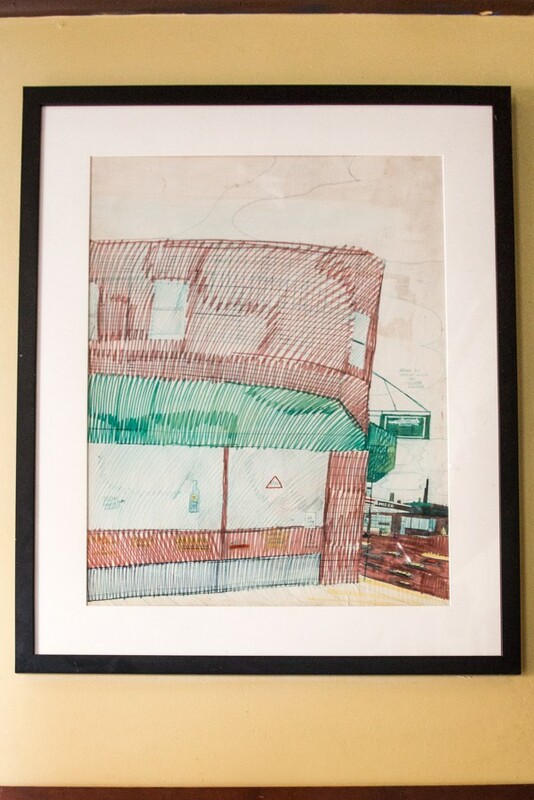 That said, one of my favorite things about Quenchers will leave with Johnson: an original drawing of Quenchers by cult musician and outsider artist Wesley Willis, which hangs in a corner between the restrooms and the cabinet-size sound booth. Willis was a regular, and Johnson says he started coming the bar a couple years before making the drawing of Quenchers in 1991. "Most bars need to have somebody that is special in order to give their place character. We've had several over the years—he was one," Johnson says of Willis. Standing six foot five and weighing more than 300 pounds at the time of his death in 2003, Willis was an outsize presence in lots of ways, and he remains part of Quenchers. 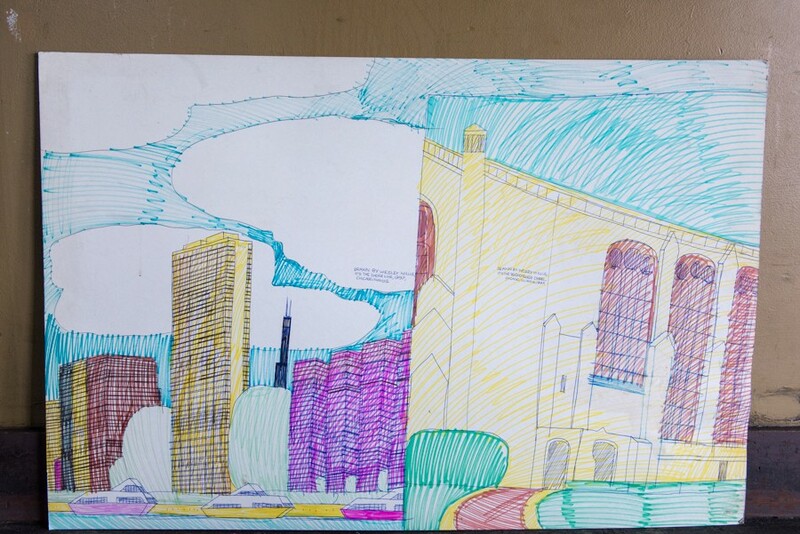 I've cherished his drawing ever since I spotted it a few years ago, in part because I like looking at it while standing in the building it depicts. I also like Willis's feverish, detailed style, which lets me see a familiar place in a different time—and through the eyes of someone who seemed like a myth when I first learned about him. Johnson didn't always appreciate Willis's art, but he's come to see its charms. 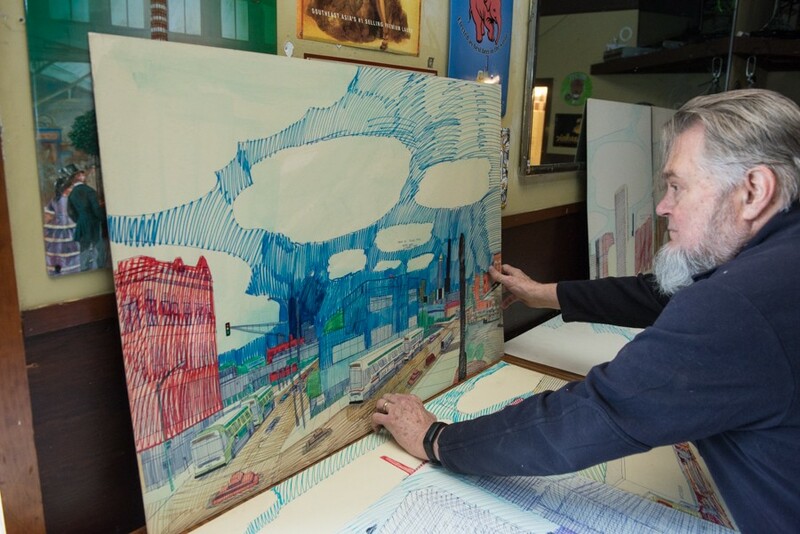 "I regarded his drawing style as kind of primitive, and as I began looking at it, I realized that there's a lot of precision in these things," he says. "He would see something and he would create that momentary scene." In his Quenchers piece, beer signs appear in the bar's windows (I think I can identify Bass and Heineken), and Johnson says some of them hung there for only a short time. The green awning Willis drew came down sometime in the mid-90s. The potentially imminent sale of Quenchers spurred me to inquire after the artwork's fate. I posted Noel's story on Twitter, joking that I wanted to buy the Quenchers drawing—and Noel replied to say Johnson had more of Willis's art. 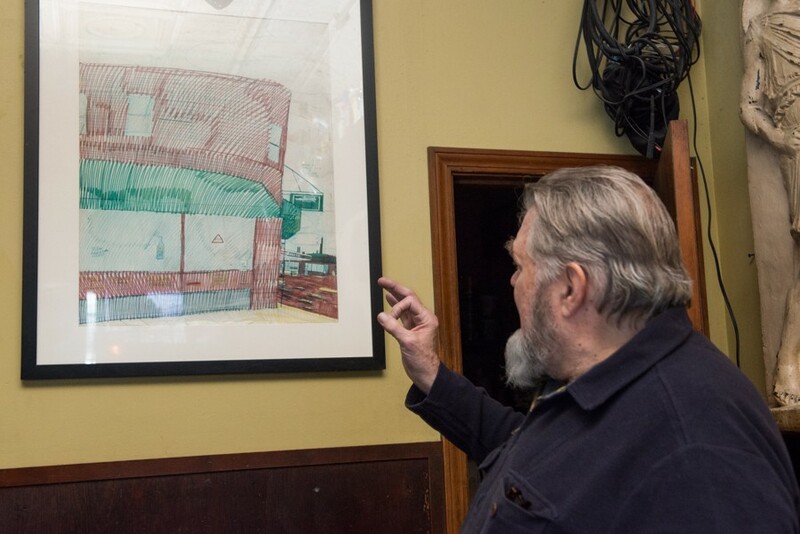 When I reached Johnson, he confirmed that he owned several drawings, and that he'd kept them in the bar's basement for years. He turned out to own eight more, and he was kind enough to dig up the poster-board pictures to show me and Reader director of photography Jamie Ramsay. 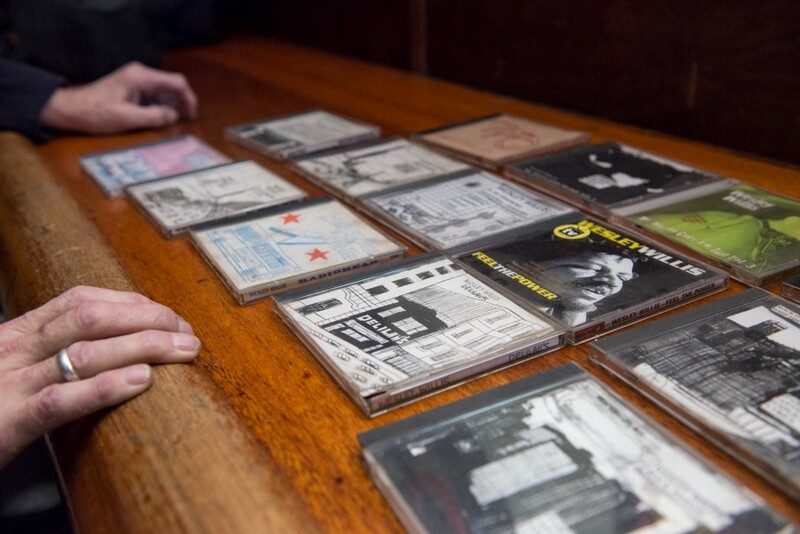 "You're the first people who've seen them—I haven't even really looked at them for years," Johnson says. "I was afraid I'd lost these, because I'd lost track of them and I couldn't find them. I went looking for them several times. And then when I reorganized the whole basement and categorized everything, I came across them and had a great sense of relief." 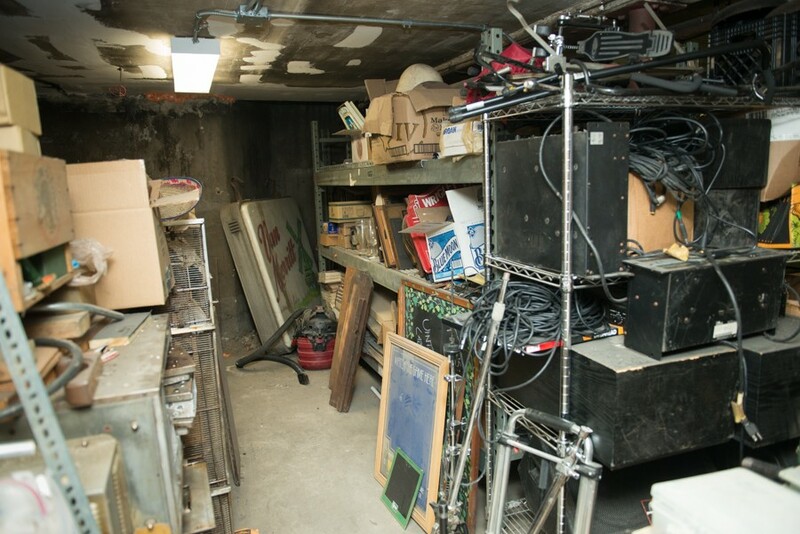 I bet you could lose track of some drawings in this basement too. Johnson is a bit of a collector—he made hoarding jokes as he gave Ramsay and me a tour of the Quenchers basement, which is filled with antique beer bottles, broken neon signs, and a whole lot of other miscellaneous breweriana. "I don't throw anything away—I'm always thinking that somewhere along the line some of this is gonna be worth something, so I can leave it to my heirs or something," he says. "I've been fortunate; I had all this space. I used to be an accumulator. I'd seek out things, even online. Particularly if people brought things in, I might buy them from them—that sort of thing. People knew that I was in the market for stuff." Willis certainly knew. In the 90s he'd haunt the corner of Fullerton and Western, drawing at Genesis Art Supply or eating at the Fullerton Restaurant or Quenchers. "We would negotiate," Johnson says. "A turkey sandwich, a glass of orange juice, and 20 bucks would buy me a portrait or a picture of some sort—or one of his CDs." He's held onto Willis's CDs too, though he's only listened to a few of them—Willis's chintzy looped piano melodies and growled vocals aren't quite Johnson's speed. "He kept saying he was gonna do a song to include Quenchers," Johnson says, "but I never saw that one." 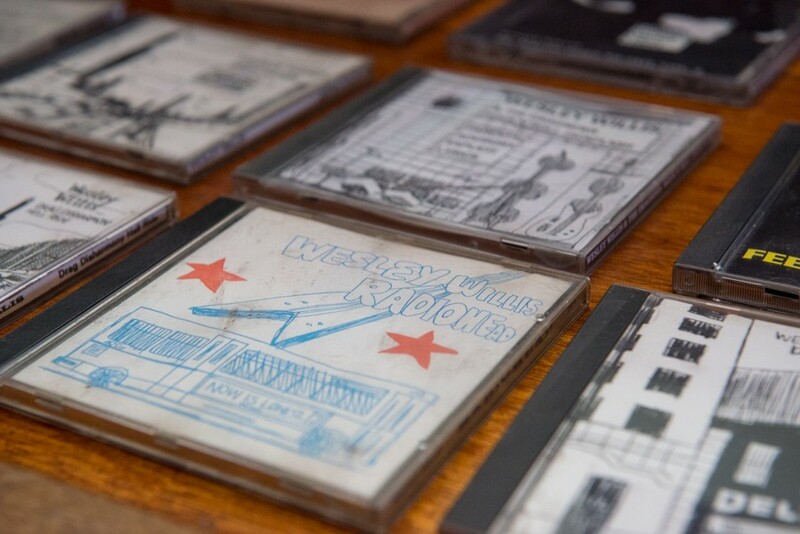 Earle Johnson owns an impressive chunk of the Wesley Willis discography. Johnson says his relationship with Willis never got terribly deep. "I don't recall having any extended conversation with him, or having any idea who he was as a person or who he might associate with or any of that kind of thing," he says. "I was more of an early patron." 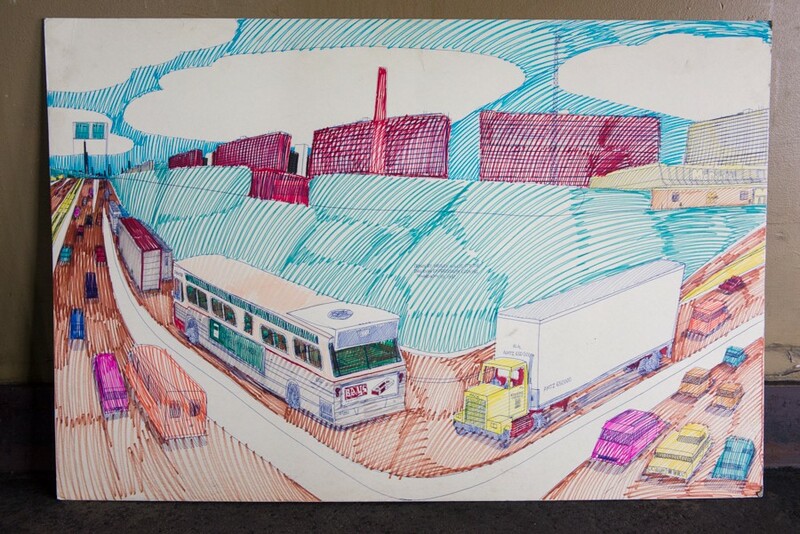 Including the Quenchers picture, Johnson bought nine drawings from Willis, all between 1990 and 1998. 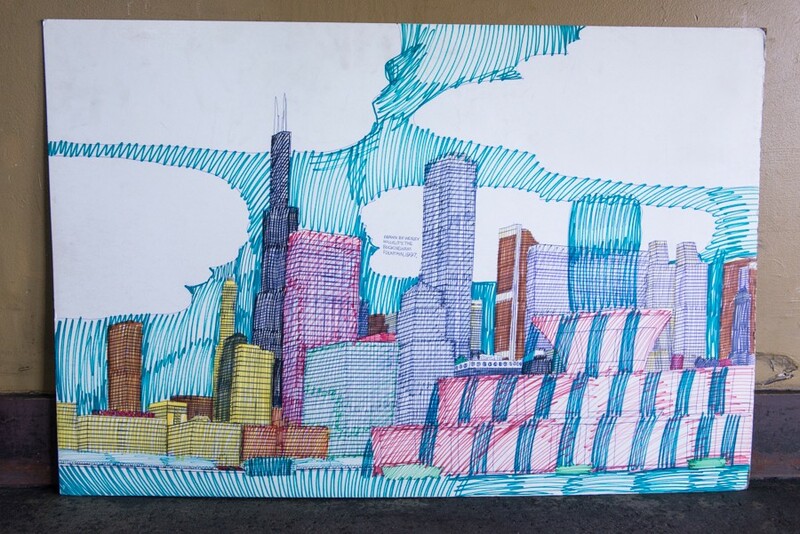 A few of Willis's frequent subjects appear in Johnson's collection, including Wrigley Field, the Dan Ryan Expressway, and downtown Chicago. 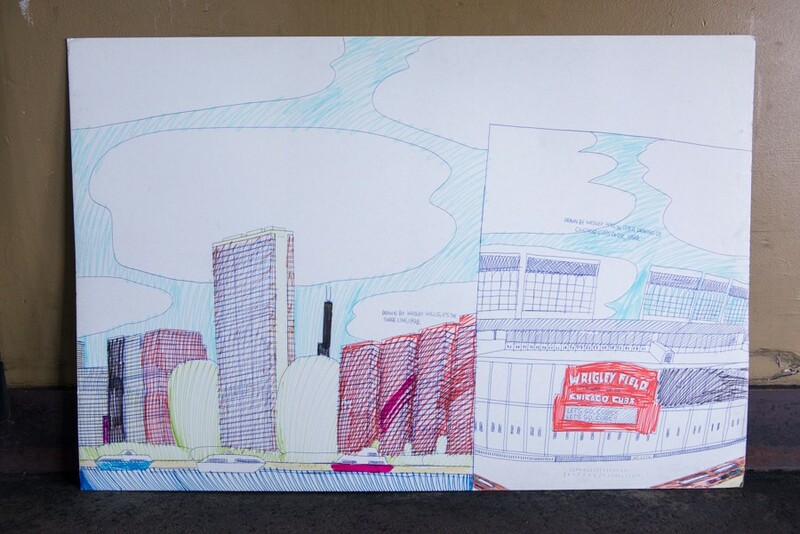 Two of his depictions of the city skyline from the lake are nearly identical, except that one shares space with an image of Wrigley Field, the other with the U. of C.'s Rockefeller Chapel. 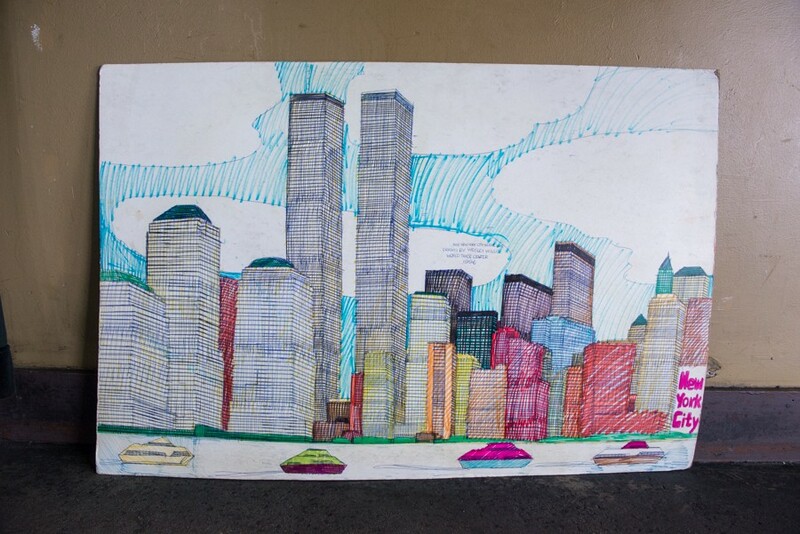 One of the most detailed pictures is of the World Trade Center in Manhattan, which Willis drew in 1996 after performing in New York. 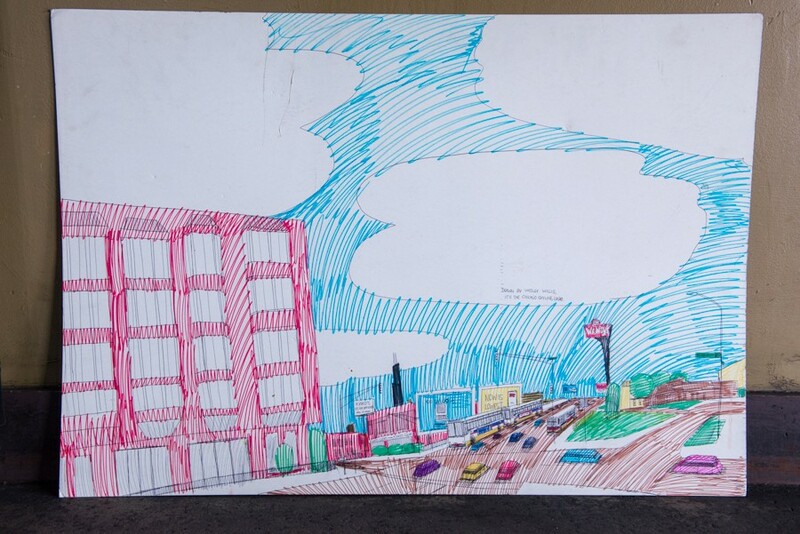 My favorite is a 1990 drawing of the intersection of Halsted, North, and Clybourn, ages before the Apple store took over the intersection. Recognize this corner without the Apple store? Johnson has tinkered with the idea of showing Willis's art. "It's something that should be displayed," he says. "They should be someplace where people can see them." 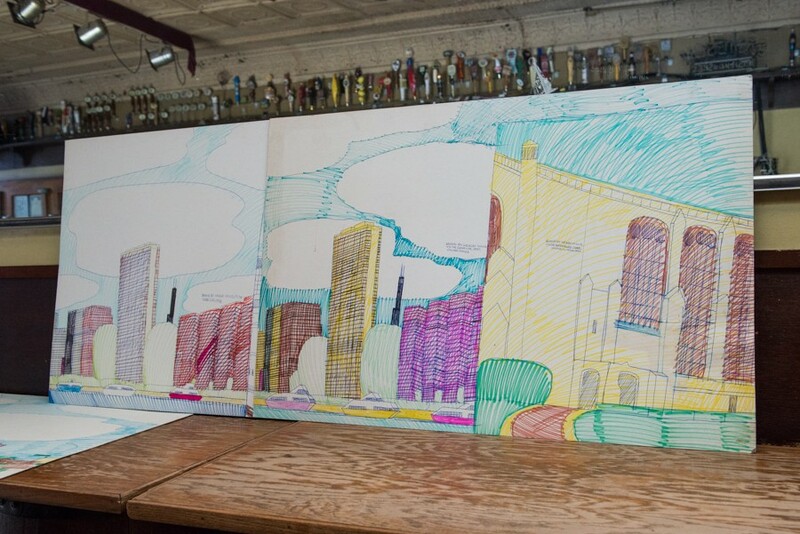 He's considered exhibiting the drawings at Quenchers, but he's afraid one would go missing. "The security isn't always the best here," he says. "We lost a moose head out of here. It had been on the wall, and we were redoing something—I think it was just sitting on the stage. Somebody took it." 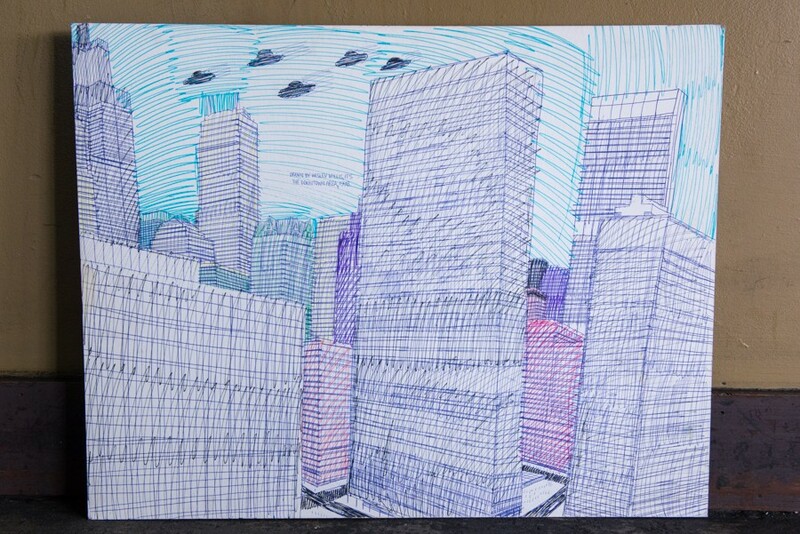 People can probably take Willis's drawings, but only if they pay for them. Johnson says he plans to sell off items from his basement separately from the sale of Quenchers. "I would like to sell them," he says. But the drawing of Quenchers will stay with him: "I won't sell my own." Willis's drawing of Quenchers hangs between the restrooms and the sound booth. If only Radiohead had collaborated with Wesley. This is where the traffic close-up came from. Wesley Willis's funeral draws a standing-room-only crowd. 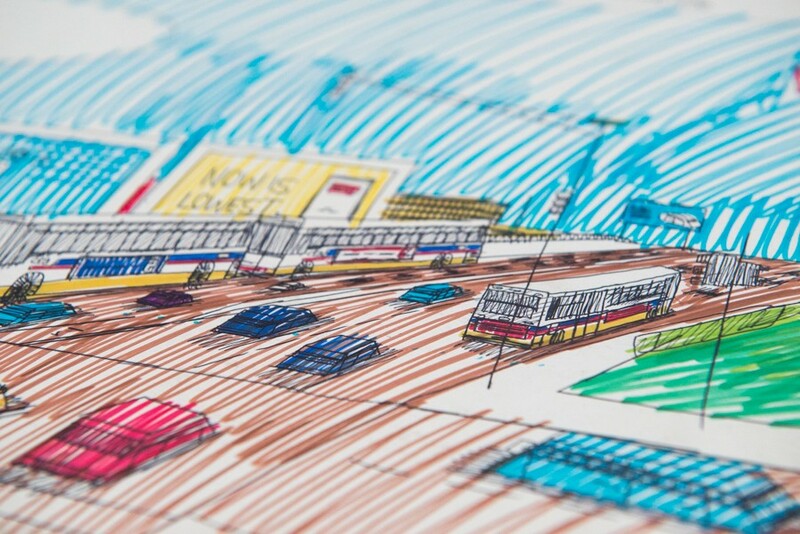 Wesley Willis: Too Much Too Soon?